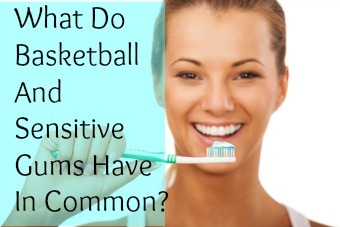 What Do Basketball And Sensitive Gums Have In Common? At least, there is a connection between the two for one of my clients. Here is the chain of events. He injured his shoulder at the start of his workout on Sunday. He ignored the injury and powered through the rest of his workout. On Monday morning, he woke up with shoulder pain and sensitive gums that both persisted until we met on Thursday of the same week. He has no history of gum disease. So why did he continue with his workout after the injury? Why do any of us do things that seem unwise? Why is he experiencing a symptom like sensitive gums that seems so arbitrary and unrelated to a shoulder injury? Upon testing (I use a type of muscle testing when working with my clients on stress management), I discovered that he had unresolved upset about not making the varsity basketball team when he was 14 years old. Most of the upset came at age 15 when he had to watch his friends playing at high school basketball games while he sat in the stands, out of the spotlight. The fact that he outperformed them on club teams made it worse. The high school coach did not see his potential and so he was excluded from this very important activity in high school. The feelings we cleared in that session included insecurity, shame, selfishness, powerlessness and bitterness all from age 15 affecting his immune, circulatory and muscular/skeletal systems. At the end of our one hour session, his gum sensitivity was gone and his shoulder was feeling much better. This situation reminded him, subconsciously, of the time when he was removed from the action in high school. Without realizing it, he refused to go there again by unwisely powering through his workout. Our subconscious mind is powerful causing us to do things we really don’t want to do like eat an entire bag of cookies or to lose our temper and damage a valuable relationship. I am writing about this today to demonstrate how events in our lives trigger old emotional wounds. Releasing the underlying emotional stress frees our bodies to heal as they were meant to. I see these interesting connections every day in my practice and am amazed at the changes I see in my clients when we remove this underlying stress. I did nothing for him physically, it was all energetic. If you have a physical condition that you are ready to heal, look first to the emotional stress that you are carrying around. Yes, that emotional baggage. It’s a simple matter to release it. The book Letting Go: The Pathway of Surrender by David R. Hawkins M.D. Ph.D is a great place to start or schedule a session with me by emailing me at toni@tonifairman.com.